Would you spend 7 bucks to make everything you write better? I think you’d be a fool not to. But $6.99 is the one-time cost of a new app that you can download to your desktop and use on whatever you write from now on. Take my word for it, the Hemingway App is worth the money. It’s easy to use. First, buy the app and download it to your PC. It will then always be there to highlight words and sentences where you can make something you just wrote better. My Clarity Tool app gives you the Flesch score, which helps make what you write easier to read and remember. The Hemingway App, though, gives you more. 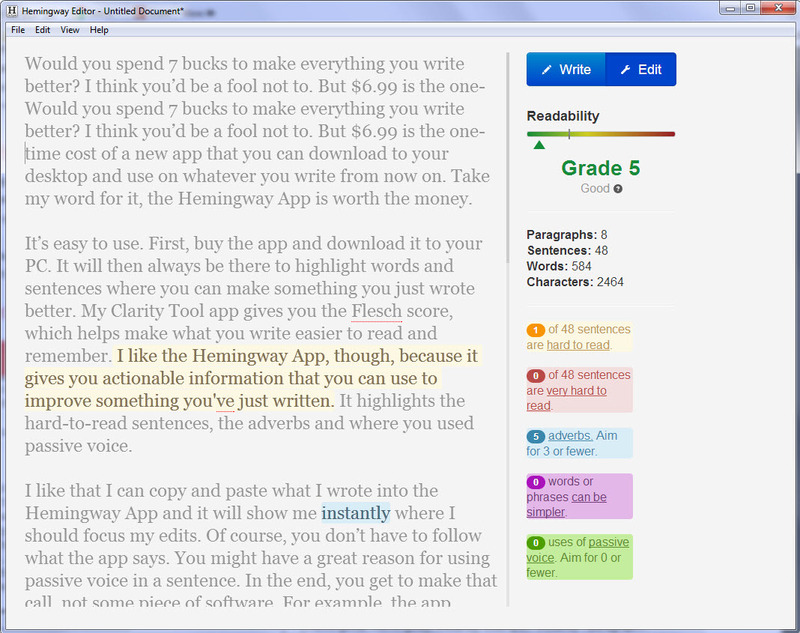 It highlights the hard-to-read sentences, the adverbs and where you used passive voice. I’ve made the Hemingway App part of my writing process. It’s my last step. Think of it as quality control. I start with a draft. When I’m satisfied with it as a draft, I copy and paste it into my Clarity Tool. I get the raw score and work to make it better. If I’m writing an important email, the first draft might score a 60. I’ll want it to be at 80, so I keep reworking it until it is. When I get the text to the score I want, I launch the Hemingway App, then copy and paste the text into the app. The Hemingway App never fails to show me something I can do to make what I was just happy with better. It has helped me, for instance, cut down on adverbs that my documents don’t need. Most people use too many adverbs. 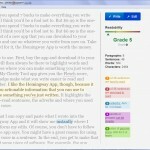 The app says that this blog copy is “Good.” (That’s the top rating.) It did flag five adverbs, but “truly” was there three times and “instantly” twice so I could make my point. Flesch gives it an 89.1. Doesn’t get much better than that.